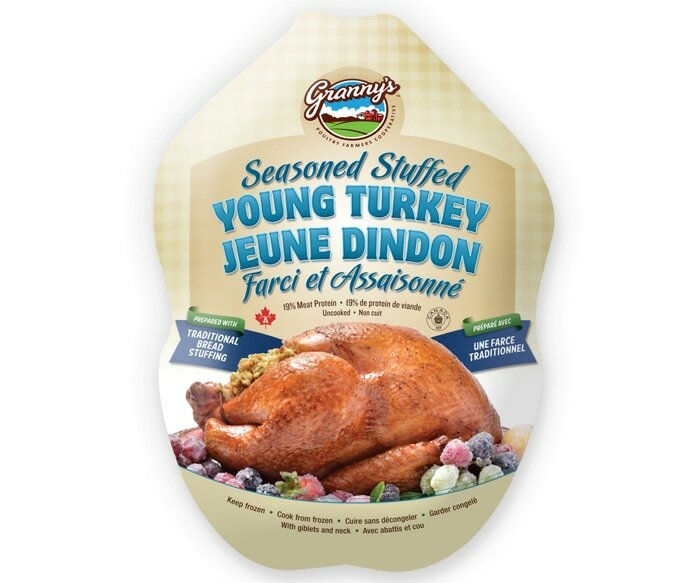 Granny’s Seasoned, Stuffed Grade A Turkeys are raised by one of Granny’s cooperative poultry farmers. This turkey is stuffed with our traditional bread stuffing. Cook from frozen for a moist and delicious turkey every time. Cook from frozen. Preheat oven to 325°F / 165°C. Remove turkey from plastic bag. Remove giblet and neck packet. Place frozen turkey, breast side up, on a rack in a shallow roasting pan. Add about 3 cm (1”) of water and brush skin with olive or vegetable oil. Loosely cover bird with foil and cook for 7 hours (6 kg bird) up to 8.5 hours (8 kg bird). Remove foil for last hour. When done a meat thermometer inserted in the thigh should read 180°F / 82°C; center of stuffing should read 165°F / 74°C. Let turkey stand for 15 minutes before carving.